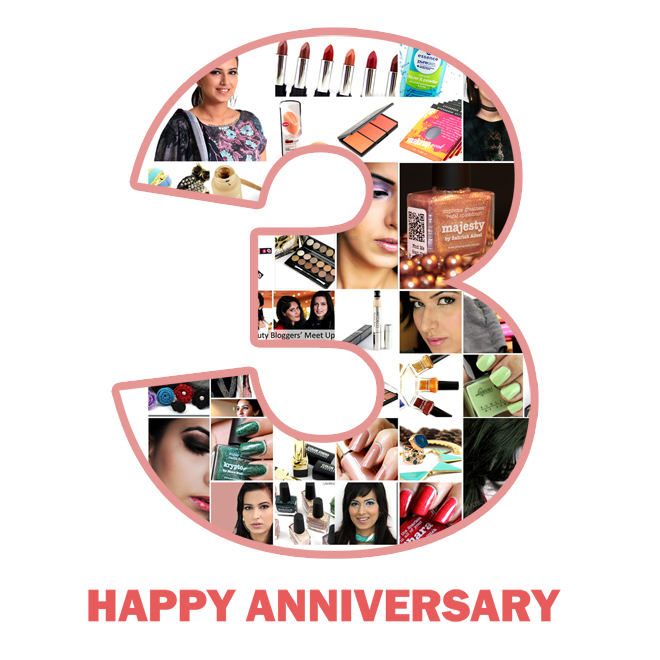 Happy 3rd Anniversary - Sahrish Adeel's Blog | Sahrish Adeel - Malaysia based Pakistani Beauty & Lifestyle Blogger! Three years ago I started blogging when I didn't know what the term blogging really meant and when I thought I will only post about my YouTube videos over here, but then I tried to write my first review which took me like seven days. I was a lot nervous while publishing my views about something as the thought of people reading it gave me goosebumps. Reviewing something puts a great responsibility on ones shoulders because it can effect so many people in so many different ways. But here I am now, three years have been past and still counting. I literally went though all my blog posts a few days ago and saw how embarrassing some of my early posts were. Terrible clicks and miserable writing was most that I did. But guess what? You guys appreciated me unconditionally every single time and that kept me going. A huge thanks to Allah Almighty for giving me strength to keep up with blogging while managing my family and work successfully. Thanks to my husband, my son, my Maa, my sisters, my brother, my father-in-law, my mother-in-law and my sister-in-law (I know this is a long list XD). These people have supported me and encouraged me even when my videos / posts were never upto the mark. They literally made me feel like I am the only good blogger in the whole wide world. A BIG thanks and unlimited virtual-hugs to my readers who have always been there and at times when I was away from blogging, you pulled me back to it with your messages / emails and also with your lovely comments that I read every time I read an old post of mine. I cannot express how many connections I have made with you all in past three years, how many blogger and non blogger friends I have made, all because of blogging. You guys are the reason that never let all that negativity stop me from getting better with each post. And I know that you all will always help me get better and improve my work. Thank you so much! And last but not the least, thanks to the cosmetics companies who trusted in my work and supported me all this time. Thanks for making all those gorgeous goodies that we makeup junkies drool over. I am going to end this post with an announcement that there will be a giveaway to celebrate this month so keep an eye on my Facebook page.